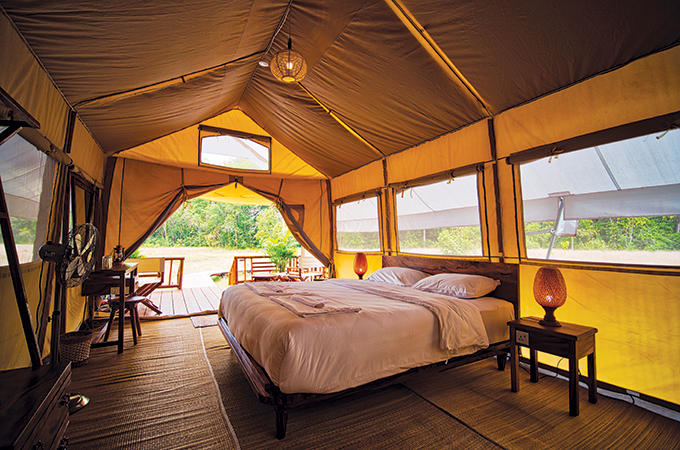 Cardamom Tented Camp in Cambodia offers nine safari-style tents, whereby eco warriors will get a chance to practise conservation on a real, grassroots level. The lodge aims to minimise human footprint in the natural world and ensures the land and its biodiversity don’t fall into the hands of loggers, poachers and sand dredging operations. These enthusiasts get their hands dirty while being able to be one with nature. Since opening, the camp has operated under the slogan, “Your Stay Keeps the Forest Standing.” Neighbouring areas in and around the 180 sq km concession have been cleared and replaced with mono-culture plantations of palm oil or rubber, with disastrous results for wildlife. By comparison, in its concession, the Cardamom Tented Camp and its partners are making a stand against habitat destruction and the trade in wildlife species by using sustainable tourism as a force for good. Since opening in 2017, the Cardamom Tented Camp has integrated the role of 12 forest rangers who protect a 180 sq km lowland forest concession into the guest experience. In turn, the camp helps the forest rangers with salary support and physical amenities such as solar power generators at ranger stations. The rangers take turn to lead conservation tourism hikes through the forest. They show tourists confiscated traps, mesh and weapons used by poachers. Due to the rangers’ work, the illegal wildlife trade has been massively reduced in the forest which is now seeing a resurgence in formerly traded mammals such as the endangered clouded leopard, sun bear, northern pig-tailed macaque, pangolin, the Nicobar crab-eating macaque, and the (extremely shy) pileated gibbon, to name a few. Cardamom Tented Camp has been chosen as one of 15 global finalists in the World Travel and Tourism Council’s Tourism for Tomorrow Awards 2019. The camp is one of three contenders in the Changemakers Award category, which, this year, is focussed on fighting illegal wildlife trade through sustainable tourism. The winners of the 2019 Tourism for Tomorrow Awards will be announced during the awards ceremony at the WTTC Global Summit in Seville, Spain, April 3 to 4, 2019.